David Koch—billionaire and co-founder of Koch Industries—added a gem to his New York real estate portfolio this summer when he picked up a seven-level townhouse in Manhattan. Koch plunked down more than $40 million for the home, which is situated on East 76th Street. The residence was, formerly, two residences; the individual brownstones which make up the finished home were picked up by a developer in 2007. 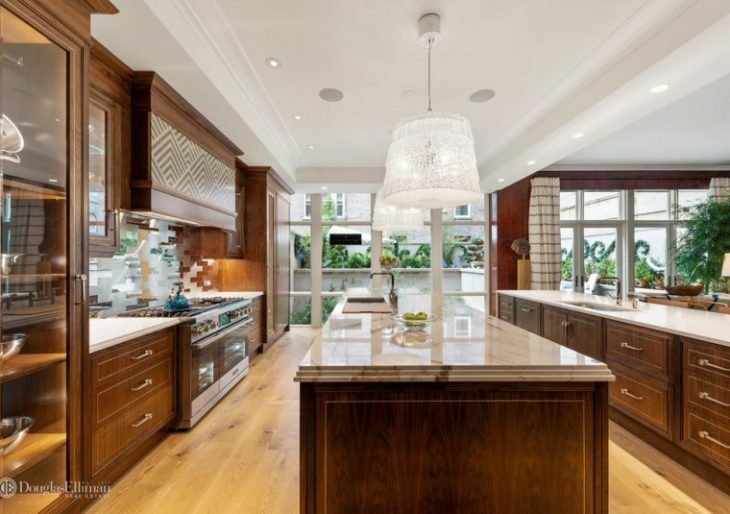 The result is a massive, 36’ wide, 15,000 square-foot downtown dwelling, which hit the market late last year with an asking price of $51 million. The townhouse features a series of striking details, including the inlaid oak floor in the great room, the natural-finished paneling in the living room, an elevator, and a staircase with a beautiful deco balustrade. The master suite that extends to 1,500 square feet, and boasts an extraordinary coffered ceiling and a private balcony; it is one of eight bedrooms in the building, and contains one of the ten full baths. There are two wet bars in the home, and several fireplaces. The revisions are tasteful, with figured marble and added wood complimenting the surviving period details. The original homes dated to the mid-1880’s, and the home has retained enough of the original features to give it a pleasing historical context. The property exterior features a courtyard with inlaid tile. And a terrace on the roof, of course.